Chess lovers use different computer platforms, either between home or office, or among family members. There’s a lovely Chess King limited time offer for you: Get just one version of Chess King 4 Mac or Chess King 4 Pro PC and get BOTH the Mac and the PC version for the same price! You can choose either download or even the DVD. If you order the Chess King 4 Mac DVD you will get also the Chess King 4 PC DVD, at no additional charge! 2 DVD’s or downloads for the price of 1! 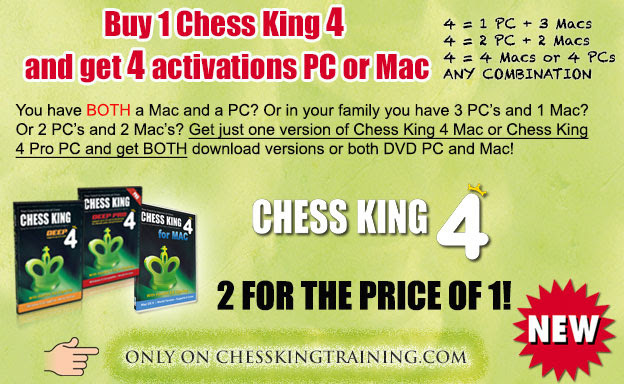 This is possible since you can have up to 4 installs/activations per Chess King, so you are free to split them any way you want among PC’s and Macs in your household. Check out the ChessKingTraining.com shop. $10 Discount + 25 New Chess King 4 Video Tutorials! For everyone excited about the new Chess King™ 4 for Mac launch last week, here’s another announcement to cheer about. You get $10 off on all purchases above $50 at the Chess King™ Online Store! 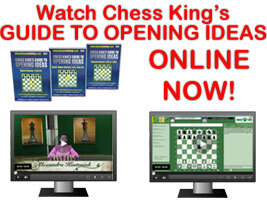 Also, Chess Queen™ Alexandra Kosteniuk has recorded two brand new video tutorials for Chess King™ 4. Together with Steve Lopez’ wonderful new 23 video tutorials you’ve got more than two hours of tutorials… guaranteed to make you a super user of Chess King™, ready to go and win more chess games. Find out more at 12th Women’s World Chess Champion Alexandra Kosteniuk’s personal blog – www.chessqueen.com. We are pleased to announce our best versions ever of our Chess King Software, which include the recently released Houdini 4 and Houdini 4 Pro engines. The software is still as easy to use and more powerful than ever. The “normal” version can handle up to 6 processors, and you could build the ultimate chess system with the “Pro” which supports up to 32 processors and 256 GB of hash. You can order the downloads today and preorder the DVD’s and get them before Christmas (they ship December 18). It’s possibly the best chess present you can make yourself or a loved one. 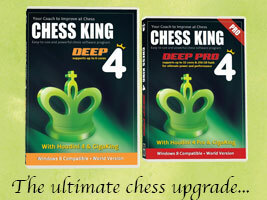 We’re pleased to announce upgrades to the popular PC chess software Chess King. Check out the new Chess King 2 with Houdini 2, and also Chess King 3 Max and Chess King 3 Pro with Houdini 3/Pro, to give you a range of options that will teach the beginner, help the club player to improve, and will satisfy the Grandmaster with its maximum power. Chess King 2 and 3 continue with their ease of use style now with a new improved interface and an updated GigaKing database (5 million games to April 2013, free updates all 2013) and full opening tree. With all those improvements, Chess King 2 is now even more affordable, with the complete program Chess King 2 at only $39.95, and very affordable versions of Chess King with the top-of-the-line Houdini 3 and Houdini 3 Pro. Compatible with all versions of Windows, including Windows 8, and in 5 languages, English, French,German, Spanish, and Russian. See below for more info and get your copy or upgrade in our shop. Email us if questions. All Chess King™ products are now available on Amazon! There are more than 20 chess items to choose from: Chess Queen™ Metal Keychains, Chess King™ Metal Keychain, Chess Assistant 13 Starter Package [DVD-ROM], Chess King with Houdini 2 (DVD), Houdini 3 Aquarium [DVD-ROM], Chess Tactics ART for Beginners [CD-ROM], Chess Assistant 13 Professional Package [DVD-ROM], Houdini 3 Aquarium [DVD-ROM], Chess King Training Combo All 6 Cd-roms [CD-ROM] Windows, Chess Strategy – Become a Grandmaster [CD-ROM], Chess Openings What You Need to Know [CD-ROM], Chess Blitz Fever [DVD], Alexandra Kosteniuk My Best Chess Games DVD [DVD] , Chess Tactics Level 1 [CD-ROM], Chess King’s Guide to Opening Ideas 3 DVD Combo [DVD]… and lots more. Super Chess Training Software, DVDs: Which One’s Your Best Christmas Gift? 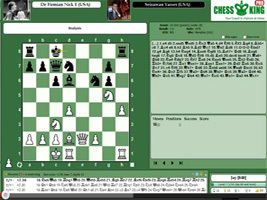 Here’s a video description of Chess King Training Software and DVD products, including Chess King software with Houdini 2 and GigaKing Games Database and Chess King Pro with Houdini 2 Pro; Chess King Training CD-ROM for Tactics, Openings, Strategy and Endgames; and the new DVD series Guide to Opening Ideas (3 volumes Open Games, Semi-Open Games, and Closed Games), and the Complete Chess Course (3 volumes, Opening Principles, Tactics and Strategy, and Endgames. 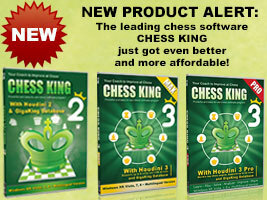 All software and DVD are on sale on http://www.chess-king.com/shop. Watch the video on Chess King products. Hello everyone! We have teamed up with Sparkeo to offer you the full Chess King’s Guide to Opening Ideas (5 hours of instruction) in an online delivery mechanism below. You have the choice to watch it online on this page at the discounted rate of $14.99 per volume (for viewing all chapters of each volume), or you can order the physical DVD’s at the price of $25 per volume or the 3-DVD combo for $54.00. Check out the introduction of each volume below. You can see a promo of the course on YouTube. Power Chess Opening Play: Do You Know How to Train? Most chess players get worried about the fact that their opponent would be using some strong chess engine and would beat them in the opening. But, fear not any more. Powerful chess opening chess play is possible with Chess King Training DVDs – and you don’t even have to worry about learning openings by heart. is pleased to announce 6 new chess DVD’s for all players Unrated to 1500-1700 Elo. The Chess King’s Guide to Opening Ideas will certainly increase your chess opening understanding and erudition, with over 8 hours of video in 93 chapters covering most chess openings. No emphasis on memorization, rather on the ideas one can find in the chess openings. This is an amazing chess openings encyclopedia which will give you confidence next time you are surprised in the opening by a variation you did not expect. Complete Chess Video Course for Unrated to 1500 Elo Players! Chess King Training is pleased to announce 6 new chess DVD’s for all players Unrated to 1500-1700 Elo. The Complete Chess Course is guaranteed to increase your level of chess up to that of an accomplished chess player. It covers all areas of chess (openings, tactics, strategy and endgames), 5 hours of lessons in 69 easy to follow chapters with more than 100 examples. Purchase right now for a huge discount at www.chess-king.com shop. Check the Chess King video for more details in the extended post. Opening Chess Training: No Emphasis on Memorization! Chess King Training is pleased to announce 6 new chess DVD’s for all players Unrated to 1500-1700 Elo. The Chess King’s Guide to Opening Ideas will certainly increase your chess opening understanding and erudition, with over 8 hours of video in 93 chapters covering most chess openings. No emphasis on memorization, rather on the ideas one can find in the chess openings. This is an amazing chess openings encyclopedia which will give you confidence next time you are surprised in the opening by a variation you did not expect. WEEKEND SPECIAL: Free CD/DVD with Chess King Special+Chess Queen Autograph! WEEKEND SPECIAL! 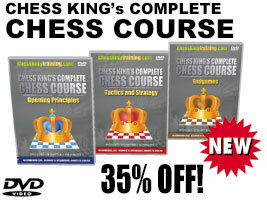 This weekend only if you buy either Chess King or Chess King Pro (with $50 off coupon INTROKING50) you get a choice of 1 extra CD or DVD FREE (any of the series Chess King Training or by Chess Queen Alexandra Kosteniuk). Mention which free CD/DVD you want when you order. PLUS Chess Queen Autograph! Our goal is to provide high quality chess professional products at an affordable price. The new professional packages CHESS KING and CHESS KING PRO are IN STOCK for an introduction price of only $49/$99, including the full GigaKing database and Houdini 2, the world’s chess engine leader. Take advantage of the $50 while it lasts and of the great combo deals. Check it out now. Chess King Video software Tutorial #1 by Steve Lopez. 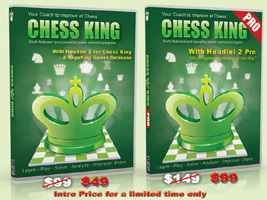 Description of the affordable ($49 with coupon) and powerful chess software Chess King with Houdini 2. With Chess King you can play chess, solve puzzles, analyze your games with the strongest engine available and have access to more than the 5 million game GigaKing database. At the moment there is a Coupon Code INTROKING50 that will let you save $50 from the list $99 price of Chess King!